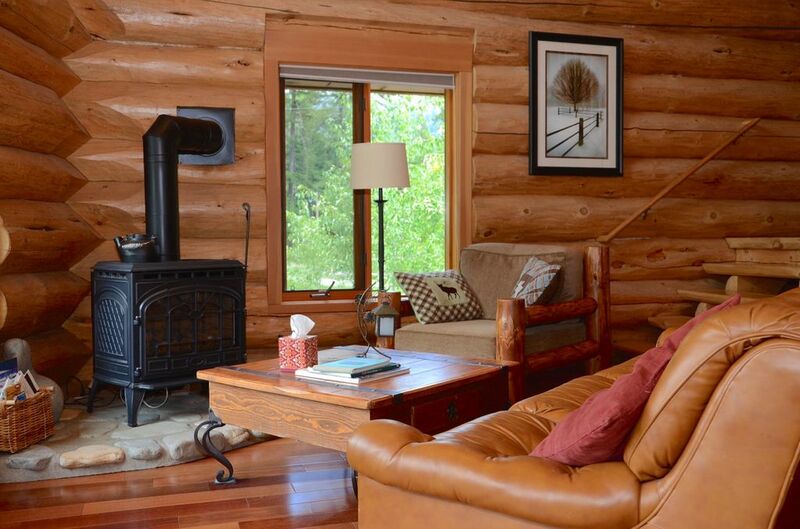 Last Chance Lodge(A legal, licensed nightly rental with a current Okanogan County health permit as required by law) sits near the banks of the Methow River in the Lost River area 7 miles northwest of Mazama. Enjoy breathtaking views of Last Chance Point and Drivewayis a gorgeous custom log home just completed in 2007 and made from hand-peeled 12-20 inch Lodge Pole Pine logs. It is situated in an ideal location next to the Methow River that offers incredible views of Last Chance Mountain. A seasonal river channel runs just steps from a large wrap-around deck, and the year round Methow River runs just a short walk beyond. The beautiful interior design includes slate and Brazilian cherry floors plus detailed log and pine walls, a complete kitchen with stainless steel appliances and Corian counter tops, and classic cast-iron gas stove. A large master suite with king bed, sitting couch, and charming tiled bathroom with an oversized soaking tub is situated upstairs. A second bedroom with queen bed, and an additional bunk room with twin bunks, are located downstairs. A queen-size sleeper-sofa is located on the upstairs landing. CHECKOUT OUR VIRTUAL TOUR by clicking the link below! We just did not want to leave!! Our family stayed in Last Chance Lodge over Thanksgiving weekend where we also celebrated two 40th Birthdays! The atmosphere of this cabin and it’s rural wooded location exceeded our expectations. We fell in love with the area and how quiet and serene it is! The cabin itself is a sight to see, amazing craftsmanship with all the comforts of home. We loved the compilation CDs someone made (great taste in music!) and sound system, a very nice addition to our fun! It snowed during our stay and we felt like we were in a snow globe. I wish we could wake up to that view and that cabin every day!! We hope to return in the future! Happy to have you stay..come back and visit the Methow again! The cabin was very comfortable and well-equipped and the location was great. The view from the cabin out toward the mountain and the river is amazing. It was a wonderful place to relax after hiking!! Highly recommended! So glad you had a nice time..happy to have you stay again! This cabin is exceptionally nice and the view from the large deck is phenomenal. Even though there are other cabins all around, the setting is very private. The only reason I rated it a 4 rather than a 5 is that the internet is pretty much useless (it shouldn't be advertised as even having internet) and the living room furniture needs to be replaced. Everything else, including the view of the river, was excellent. We stayed in this cabin in August/Sept. 2010. This was our favorite cabin while we were in Washington. We hiked in mt. Rainer area, northern cascades, and Olympic. We watched the deer every night from the den area. Everything was clean and comfortable and just as it looks in the photos. The gas station in mazama had excellent deli food and pastries. This is a very secluded, peaceful area and that is exactly what we wanted. Rates are subject to change until reservations is confirmed.